Sick of serving up your burgers in lettuce wraps? Miss the mouthfeel and taste of a deliciously dense burger bun? Then look no further. This keto burger bun recipe is the perfect companion to a delicious, juicy, grass-fed burger. Whether you’re enjoying a low-carb dinner for one or a family BBQ, these keto buns will be a keto staple in your household. Plus, the dough doubles as dinner rolls or hot dog buns. 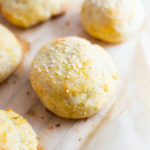 Ingredients like almond flour, cream cheese, eggs, and grass-fed butter create a keto bread alternative so nutrient-dense, they’ll leave high-carb grocery store buns in the dust. Low-carb hamburger buns are essential for a keto diet, so if you’re ready to up your burger game, read on! These keto buns are undoubtably for your blood sugar than your average grocery store buns. But there’s another reason to take the extra step and make your own buns — quality control. Most bread products are packed with refined ingredients and additives. Making these keto hamburger buns from scratch means you get to skip the fillers and preservatives, and whatever other cost-saving tactics the food industry is using to save a buck. There is a direct correlation with the increase in consumption of refined grains and the incidence of type 2 diabetes in the United States[*]. If you consider all the processed and refined products that populate the center aisles of grocery stores, this statistics is disturbing, to say the least. Even more upsetting is research connecting the dots between autoimmune disease and refined foods. Along with diabetes, the incidence of autoimmune disease (when your immune system turns on itself), is increasing as consumption of processed foods rises [*]. The reason for this likely has to do with your gut health. There’s a well-established link between the health of your gut and the health of your immune system. And eating processed foods may be harming the lining of your gut, which can create the perfect environment for autoimmunity[*]. To keep your immune system strong, avoid processed foods and cook from scratch when possible. Luckily, this keto bun recipe is as easy as it is delicious. Nearly half of the U.S. population isn’t getting enough magnesium. You don’t hear about the need for magnesium quite as much as iron or calcium, but it’s an essential mineral that supports nearly every major function in your body[*]. Luckily, this recipe has two great sources of magnesium — sesame seeds and almonds. So how does magnesium work in your body? Low magnesium has been linked to type 2 diabetes, metabolic syndrome, elevated inflammation markers, heart disease, migraine headaches, and osteoporosis — to name a few. Cells low in magnesium can even trigger systemic inflammation, which is the root of nearly every modern metabolic disease — no injury, virus, or bacteria needed[*][*]. Magnesium may also help with constipation. Although, it’s important to be careful with certain supplemental forms of magnesium, which have a laxative effect[*]. Magnesium is also essential for bone health and even makes your teeth stronger. Altogether, magnesium has an essential role in over 300 cellular reactions. But this busy nutrient needs to be replenished often, so make sure to get these keto hamburger buns in your food rotation[*][*]. These hamburger buns are not your typical store-bought buns. Instead of high-carb, low-calorie bread, these buns are packed with fat and protein — perfect for a low-carb diet. They’re loaded with nutrients you would never find in processed grains and free from blood sugar-spiking ingredients. Beyond this, there are a few compounds in this recipe that may have a direct effect on your blood sugar. CLA, from grass-fed butter, being one of them. CLA (conjugated linoleic acid) is a fatty acid that’s found in abundance in grass-fed butter. Although the exact mechanism is still unknown, studies have found that CLA improves insulin sensitivity[*]. Improving the insulin sensitivity of your cells means that your body is using more glucose as fuel instead of hanging out in your bloodstream wreaking havoc on your health. Almonds are another ingredient tailor-made for blood sugar control — and this recipe contains three cups of almond flour. Almonds are high in dietary fiber, healthy fats, and magnesium — it’s no surprise that they’ve been studied in diabetic patients. One study even found that almond consumption improved blood glucose and lipid profiles in a group of people with diabetes[*]. And you can’t forget your old friend magnesium, which may also improve your cells sensitivity to insulin in supplemental doses[*]. It’s time to say goodbye to lettuce wraps and whip up a batch of these low-carb burger buns. And don’t’ forget — this dough is perfect for hamburger buns, low-carb bread, hot dog buns, or pizza crust for even more variation. These gluten-free buns are even better because they’re made with almond flour instead of coconut flour — so, no coconut-y taste. And last but not least, they have a prep time and cook time of just 20-minutes and a total carbohydrate count of just 2.4 grams per serving. And they’re packed with protein. Perfect for your low-carb, keto lifestyle. For more free recipes and keto meal plans, check out the Keto Kickstart — a 30-day program to get you into ketosis easily and painlessly. These keto hamburger buns made with almond flour, cream cheese, and sesame seeds are low-carb, gluten-free, and only 2.4 net carbs. In a large bowl, melt together mozzarella and cream cheese. Add 3 eggs and stir to combine then add almond flour. Form dough into 6 bun-shaped balls then place on prepared baking sheet. Brush with butter and the last egg and sprinkle with sesame seeds. Bake until golden, 10-12 minutes. Keto Matcha Green Tea CupcakesTop 10 Ketosis Symptoms: How Do I Know if I’m in Ketosis?